Fibromyalgia is a complex medical condition characterized by widespread pain. 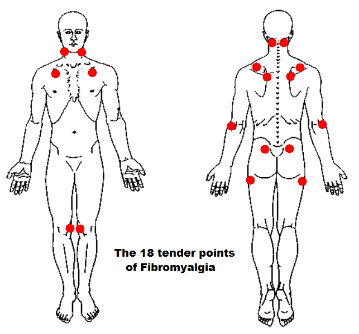 Fibromyalgia syndrome affects the joints, muscles and soft tissue. Symptoms include chronic muscle pain, fatigue, sleep problems, and painful tender points or trigger points, which can be relieved through medications, lifestyle changes and stress management. A history of widespread pain – pain in all quadrants of the body (the right and left sides of the body, both above and below the waist) and axial skeletal pain (the cervical spine, anterior chest, thoracic spine, or low back) – that has persisted (or that persisted) for at least 3 months. At least 11 positive tender points on physical examination (of 18 tender point sites). A tender point is positive if the person experiences any pain when applying pressure. The positive tender points must be found bilaterally (on the left and right sides of the body) and both above and below the waist. Inner aspects of the knee. 3. Evidence that other disorders that could cause the symptoms or signs were excluded. Evidence that other disorders that could cause these repeated manifestations of symptoms, signs, or co-occurring conditions were excluded. Once it is established that a person has a medically determinable impairment, SSA will evaluate the case under the sequential evaluation process to determine whether the person is disabled. SSA will consider the severity of the impairment, whether the impairment medically equals the requirements of a listed impairment, and whether the impairment prevents the person from doing his or her past relevant work or other work that exists in significant numbers in the national economy. For more information on the 5-step sequential evaluation process for Social Security Disability, please click here for our post.